The 74AC541 and 74ACT541 are octal Buffer Line Drivers designed to be employed as memory and address drivers, Clock Drivers and bus oriented transmitter/receivers. These devices are similar in function to the 74AC244 and 74ACTC244 while providing flow-through architecture (inputs on opposite side from outputs). 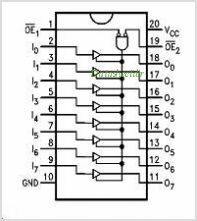 This pinout arrangement makes these devices especially useful as an output port for Microprocessors allowing ease of layout and greater PC board density. This is one package pinout of 74ACT541,If you need more pinouts please download 74ACT541's pdf datasheet. 74ACT541 circuits will be updated soon..., now you can download the pdf datasheet to check the circuits!